KEN DOHERTY’S DREAM of clinching a second world championship was dashed on Sunday evening as Neil Robertson clinically disposed of the Dubliner. Trailing 7-2 going into the late session at The Crucible, Robertson quickly added to his tally before Doherty tagged him back with solid break-building making it 8-4. Robertson, the 2010 World Champion, had done most of his damage on Saturday when he recorded three century breaks to leave Doherty, champion in 1997, reeling. The Australian posted the big scores when the match was poised at 4-2 but could not match it four centuries in a row – an unprecedented feat – when play resumed. Play was taken up to the mid-session interval but Robertson took an early chance in what was to be the final frame and won the match 10-4. Doherty had defeated Anthony Hamilton in the final qualifier last week to seal his place at snooker’s premier tournament. He has stated that he will not consider retiring from the game as long as he remains competitive and is still ‘enjoying it’. Northern Irishman Mark Allen was also eliminated. He lost 10-6 to world number 81, Cao Yupeng of China. Stephen Hendry advanced after beating Stuart Bingham 10-4. Email “Early exit: Ken Doherty crashes out at Crucible following Robertson defeat”. 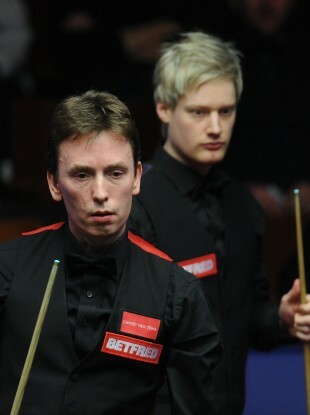 Feedback on “Early exit: Ken Doherty crashes out at Crucible following Robertson defeat”.